I’m thrilled to be able to interview author Christine Norris and gain insight into her writing process and learning more about her and her writing. 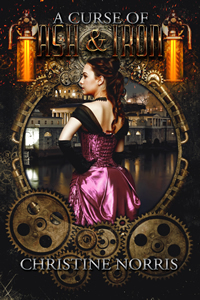 A Curse of Ash and Iron is a Steampunk/Magic novel. It’s a Cinderella retelling set in 1876 Philadelphia (the year of the Centennial Exposition, completely not-coincidentally). Eleanor Banneker is living like a servant in her own home, forced into servitude by her stepmother. She is also cursed so that no one recognizes her. Except for Benjamin Grim, her childhood friend, inventor, and hopeful Illusionist. For some reason he is able to see through her enchantment. Once he finds out what is happening at the Banneker house, he becomes determined to help her get out from under her stepmother’s thumb. I started my first book in 2001, and it was published in 2005. If my math is correct (and I make no guarantees), that’s 18 years? Wow, time really does fly. I don’t know if I had a moment. I’ve written off and on my whole life, starting and then starting. I had an English teacher in High School who told me I should be a writer. I didn’t listen to her, because I was going to be on Broadway. Well that didn’t work out as I hoped, so here we are. I have a list, I don’t think I could choose one. All the biggies in fantasy, of course, and I’m discovering new authors all the time whose work I enjoy. Wow, that was a non-answer, huh. I will always love any Harry Potter book. Sorry, not sorry! I have several other fantasy novels for middle grade and YA ages. The Library of Athena series, two magic school books, and some others. And there are a couple of short stories floating around. RUN! Ha, no seriously, keep working at it. Read, read, read. Read books like what you write and books that are different. Read some non-fiction. I love all kinds of media, TV and film, and I often get inspired by that. So take in anything that inspires you. Do other things that make you feel connected, like painting, or walking outside. Have you won any awards or accolades for your books? No, but not for lack of trying! Very part time. I have a full time job and my family likes to eat. But I keep plugging away at it! I like to read, crochet, mostly amigurumi, paint, and complete virtual races. I know, the exercising thing is new to me, but getting those medals is really rewarding! I’m also a huge Disney and Harry Potter fan! I think it’s up to ten? One of which isn’t published yet, it’s with my agent. Another steampunk fairy tale that hopefully will sell. When a book is finished. Honestly, when I see that the story is finally coming together and it’s good and I love it. Because there’s always a love-hate relationship with a story, especially in the first drafts. I want what I envision to just show up on the page and it never does. I do a couple of different things. I might take a walk, or read a book, or watch a show I know makes me feel inspired. Some people won’t read books that are like what they are writing, but I find that reading something in the same vein gets my wheels turning. Sometimes just taking my laptop to a new place, like a coffee shop instead of my desk, gets things moving. I don’t have anything scheduled currently, but if you like my FB page or follow me on Twitter I keep that updated pretty regularly! I also have Instagram, but that’s a hodge-podge. But if you want to see cute pictures of my dog, please follow! That depends. Sometimes they just pop into my head, fully formed. Sometimes I get a little bit, and then I learn more about them as we go into the story. Editing is where the magic happens for me, so I always find out new things during that process. All are available in paperback and Kindle, and some are in Nook format or others from the publisher. That depends. Sometimes I just choose names I like (I’m an elementary school teacher by day, so I have a ton of interesting choices all the time). But for Curse, I specifically chose names that were from my family tree. I think that everyone except for the stepmother has a first name that I found doing genealogy research. Oh, gosh, I think sometimes those “in-between” scenes. I know the ‘big’ things that need to happen, but you always needs some lower-key scenes, to make the story interesting and so that it has peaks and valleys. If you didn’t have them the story would be exhausting. But those same scenes also need to be important and move the story, not just filler. I call them connect-the-dot scenes. Sometimes it’s hard to keep them from being boring. My family and my co-workers, I suppose. And other writers! They are always super supportive. Sort of? I don’t intentionally (mostly) but sometimes it happens. I know it sounds terribly predict able, but Disney World. We love it and we’ll be taking our third trip there this summer. Halloween! I adore dressing up and decorating. (was there any doubt about that?). Last year I made a Winnifred Sanderson costume from Hocus Pocus. It was a real challenge because I had to resize the pattern first. Halloween is the spookiest, best time of year where it’s okay to wear corsets and elaborate gowns while walking down the street 🙂 Plus crisp fall weather and pumpkins!